I don’t like dark green ink. I’ve tried, but it’s just not my cup of tea. A FPN friend sent me part of a bottle of this ink in hopes of swaying me. It didn’t work. Nevertheless, I know many of you love dark green, so I thought I’d review it for you. I’d describe this ink as a very deep dark forest green with a bit of a glow to it. 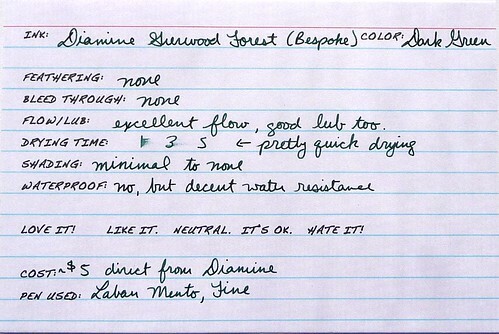 My understanding is that this ink was formulated to be similar to Noodler’s Zhivago, but greener. I think it has done it.